EPOXOTHERM ® is a two-part epoxy coating, which produces a hard, yet flexible coating film. When totally cured, the coating will have an equivalent insulation value up to four inches of batt insulation when applied at 80 mils dry. This epoxy coating was formulated with several ceramic compounds, and designed to slow conduction from radiant heat sources. EPOXOTHERM ® was designed for use under water or in areas where constant splashing or condensation is a problem. It is resistant to chemicals and solvents, and can be applied to metal, concrete, masonry and wood. Surface must be clean from oil, tar, rust, grease, salts, and films. Use general degreaser if needed. Clean surface using TSP (tri-sodium-phosphate) or a citrus cleaner to release dirt and degreaser residue. Pressure-wash if possible @ 3500 psi. EPOXOTHERM ® must be applied during proper temperatures (below) and the prescribed overcoat window of the coating over which it will be applied. If applied over an existing coating having a glossed or shiny finish, it must be sanded and roughed to remove gloss before application, to improve the profile. Additional coats of EPOXOTHERM ® can only be applied when the 1st coat becomes tacky to the touch and has little to no transfer of coating. After this stage, the surface must be lightly sanded to improve the profile. Mix by hand for two minutes, or using drill and mixing blade for a minimum of 30 seconds with NO vortex. Apply between 40°F (4°C) and 100°F (38°C). Maximum temperature for continuous use when cured is 300°F (149°C). Store unmixed product between 40°F (4°C) and 100°F (38°C) according to hazmat standards on MSDS. Mix base and curing agent and use immediately if ambient temperature is above 60°F (16°C). If below 60°F (16°C), allow mixed product to stand for 30 minutes before using @ 70°F (21°C). EPOXOTHERM ® can be applied by brush, roller or spray; however, the preferred method is by air or airless sprayer. If application is by brush, use a soft bristle brush. If application is by roller, use a 1/2 inch nap roller. If application is by spray, use a standard airless sprayer (2 gallon/minute at 3,300 psi.) with a .029-.033 tip. • NOTE: The number of applications and thickness of each should be in accordance with the job specifications. • NOTE: Temperatures must always be a minimum of 5 degrees above the dew point during application. / 3.67 mils dry (200 microns wet / 97 microns dry) to prime. Then apply 4 applications of EPOXOTHERM ® @ 64 sqft / gal (6 sqmtr / gal); 25 mils wet / 16 mils dry (625 microns wet / 400 microns dry) each coat, as a minimum thickness to stop condensation. Note: Surface and ambient temperatures will determine cure time. Introduction of heat over surface will enhance the cure time. Induction Period: 30 minutes at 70°F (21°C); No induction time is necessary over 90°F (32°C). Note: It is critical that each coat of EPOXOTHERM ® be firmly adhered to the substrate before the next coat is applied. Depending on ambient and surface temperatures, it may take longer than a 24 hour recoat application window. NOTE: When used in exterior coating applications, EPOXOTHERM ® should be top coated with ENAMOGRIP ® white to prevent chalking and loss of gloss. For insulating pipes from condensation, apply in 1 - 4 coats at 100 sf per gallon 16 mils WFT or 10.21 mils DFT per coat. For insulating cold pipes from icing, apply in 4 - 8 coats at 100 sf per gallon 16 mils WFT or 10.21 mils DFT per coat. WFT per coat depends on vertical or horizontal substrate orientation. On a horizontal substrate the maximum WFT is 35 - 40 mils per coat. 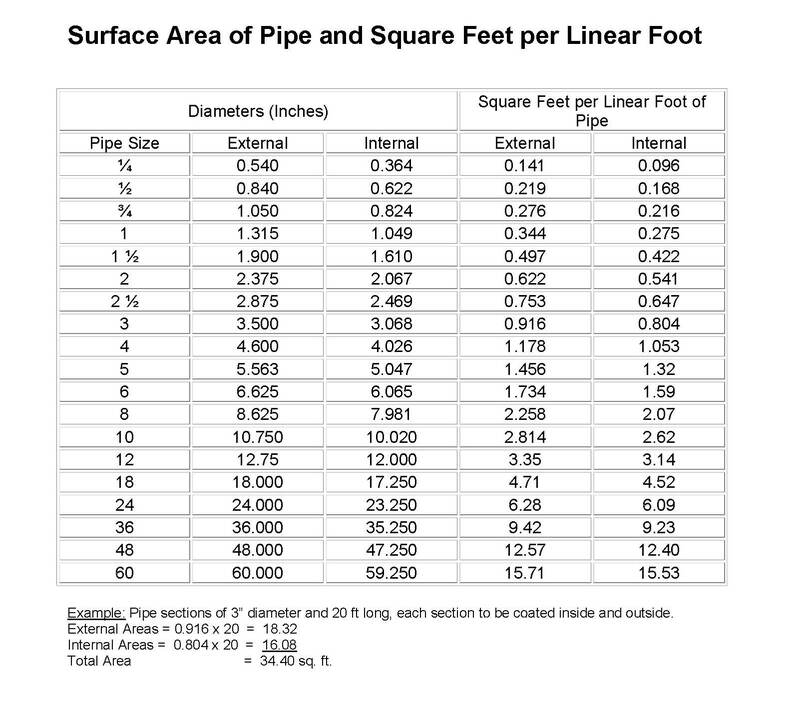 To assist in the calculation of the radiating area of a pipe here is a chart. Applicator must, at all times during use, wear a Bureau of Mines-approved, 2-stage (charcoal and cotton) paint spray respirator, designed for removal of organic vapors, or a fresh air-supplied type of respirator. Protective clothing and protective eyewear (goggles) are recommended. Do not apply over chlorinated rubber or where chlorinated rubber has been. Even after sandblasting, the chlorination can attack the solvents and brittle the coating. Thickness depends on dewpoint differential and surrounding conditions. NOTE - 1 mil = 1 thousandths of an inch 1/1000"
Solids by volume: 63.8% avg. Weight per gallon: 9.5 lbs. VOC: 298 grams / liter or 2.49 lb. / gal.